An excellent feature in Mac OS X are the several built-in media encoding abilities, allowing anyone to encode and convert video and audio files to other formats right on the desktop or from any Finder window. 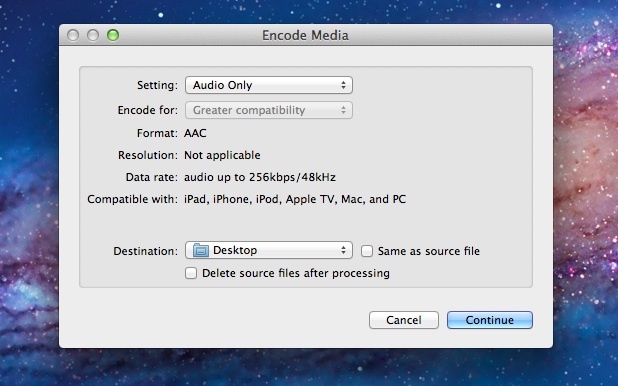 Having covered a tip on how to convert video to audio using these media encoders, we discovered the feature isn’t enabled by default for all Mac users. If your Mac is missing the “Encode” menu options, or you want to adjust them, toggling the menu encoder is very simple. Note: you will need a modern version of Mac OS to have these features available to you. Anything beyond Mac OS X version 10.7 or later will have this feature on the Mac, High Sierra, El Capitan, Lion, Mountain Lion, Mavericks, Yosemite, etc all include this option, but earlier versions of Mac OS and Mac OS X do not have these options. Now that the Mac OS X media encoder is enabled, you can right-click on media files to convert one video file format to another, convert 1080p video to lower resolutions like 720p and 480p, convert video to audio tracks, and audio to m4a which can then be turned into ringtones and text tones. Note if you want both audio and video encoding options you need to check them both in the preferences. Conversion is surprisingly quick and produces high quality media files, the precise resolution is dependent on which output option chosen. Lengthy HD files like 1080p video files can take quite a while to convert, so give the movie time to encode to the new format or resolution. My settings were already like that in Lion also. Thanks to this while I was in the dialog box I checked out the other options. In the Mission Control settings I found the way to customize swithcing between desktops similar to Spaces. Very cool. I need to convert *.mkv to DVD. How to add encoders ? Is there anyway to convert FLAC using this no? Thx a lot! That made my day. I was looking precisely for this option. 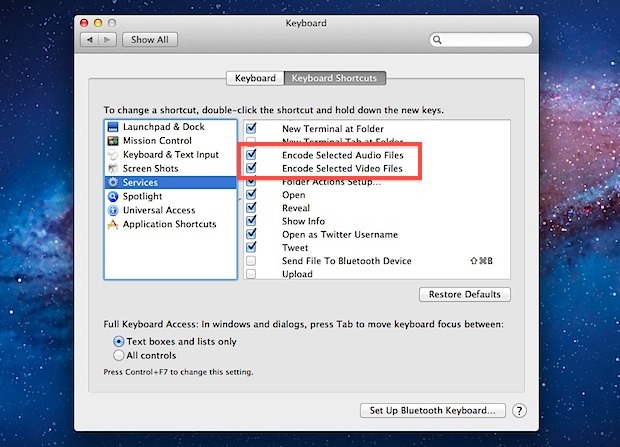 The conversion option missing from ‘keyboard shortcuts’ on a recent iMac is – Encode Selected Audio Files. There are misspellings also – Open man page and Search man Page, instead of ‘Main Page’. PLEASE HELP – AUDIO PROBLEM WHILE CONVERTING. when I try to encode an AVI to 720, the video works great, but audio always cuts off after about 10 minutes. The footage I’m converting is around 1.5 hours (Church services) if that makes any difference. Thank you so much! I can again edit my videos using the old QuickTime Pro player. Hi, I’m trying to download the audio from my uni lectures which are recorded and uploaded to echo360.org.uk by lecturers. Right-clicking only gives me the options of saving the target or going back an action in safari, how to I get the same drop-down menu so I can save the audio/video?